The Bridge Lane label is produced by my friends from Long Island, New York: Lieb Cellars. If you'd like to learn more about them please read my article A Brief History of Lieb Cellars. They're great people with a great story and they make awesome wine. Last year I had the pleasure of drinking this wine and was surprised at, not only how different it was than expected, but by how much I loved it. So, when October on the blog became dedicated to Merlot in honor of International Merlot Month (thanks to MerlotMe.com), I immediately thought of installing it as an addition to the line-up. A whole month dedicated to one varietal? That's a lot of Merlot. I had to place something a little different into the mix, and this was the obvious solution. White Merlot is usually pink and sweet and cheaply made but what I have here is none of those things. It's white and it's dry. The juice was not allowed any skin contact, thus the color, and was fermented to completion, thus the dryness. The result is a lively, delicious white wine that will change your view on the potential of White Merlot forever. It may be rather simple but what it offers is expressive and powerful. The color is damn near close to being clear. There's aromas of crushed stone, grapefruit, tangerine and a fiery spiciness. On the palate it's medium bodied, very round and milky in mouthfeel, and off the charts in its high acidity. It's ridiculously lemony in flavor, with apple and cilantro backing it up. The finish is lemon with salivating acidity. I really think fish tacos would be a great pairing. 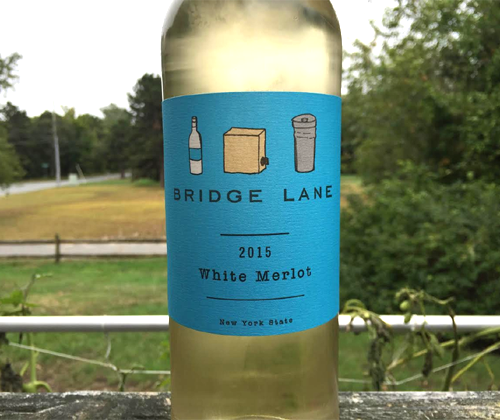 Bridge Lane's White Merlot is an enormous improvement over the average lackluster $15 Pinot Grigio and a must try for your average $15 Sauvignon Blanc consumer. Recommended!